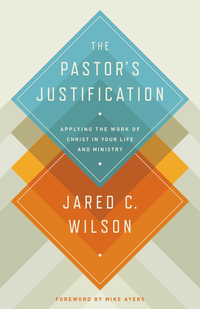 The title of this post is just one among many sentences I underlined in reading Jared Wilson’s The Pastor’s Justification and as I’ve tweeted several times, I was greatly refreshed and challenged. If you’re in pastoral ministry I would encourage you to have his book on your shelf. Pastors are not managers of spiritual enterprises but are called to be shepherds. Shepherd the flock that is among you, not some other flock. The Bible commands good behavior but doing always flows from being. Pastors need to come out of their office and be among the flock. Pastor, whatever you are, your church will become. We do not pursue holiness as the means of salvation; we pursue holiness as the fruit of salvation. Pastors you are to be holy. A message of grace will attract, but a culture of grace will keep people. When we cease to pray for ourselves, it is because we are the captains of our destinies. When we cease praying in our sermon preparation, it is because we think our words are the power of salvation to all who believe. It is very difficult for a pastor who goes to the Bible constantly in a submissive, prayerful, and open posture to come away from it thinking his ideas are better. God’s word shapes us, fills us, and completes us. Pastoral integrity does not develop in a vacuum. It is made or broken in a community of friends where the gospel is well applied. In churches with healthy discipleship cultures, church discipline is going on all the time in helpful, informal, everyday ways. Because of Christ’s perfect work on your behalf, your failure, anxiety, unwillingness, stress, sin, brokenness, ineptitude, ignorance, awfulness, regrets, pride and arrogance are no match for the deep and abiding grace of God given to you before time began and now forevermore. Preaching is proclamation that exults in the exposing of God’s glory. Preaching is worshipful projection of God’s anthem of his own awesomeness. Expository preaching has as its aim to explicate what the text means, expound on how it applies to the lives of the hearers, and explain its connection to the gospel story line of the entire Bible. We are not charged with creating fruitfulness but simply and gloriously preaching the Word. The gospel of grace is the power of salvation, which includes our definitive justification, our progressive sanctification, and our future glorification. What you win people with is what you win them to. Therefore, do not drift preaching the gospel of Jesus Christ. Be unrelenting in this commitment. The one mediator between God and man is Jesus Christ, not the pastor, programs or even your faith but solely Jesus. Additionally, you can read a review of Wilson’s book here. September 20, 2013 in Leadership, Sanctification.